At the award ceremony for the 13th Helvetia Alpine Protection Forest Award in Klosters, canton of Graubünden, projects from Austria and Switzerland were honoured. Ruedi Walli was recognized as a protection-forest patron for his services to protection forests. On 1 February 2019, the Consortium of Alpine Forestry Associations (Arbeitsgemeinschaft Alpenländischer Forstvereine) presented the 13th Helvetia Alpine Protection Forest Award. The members – forestry associations from the Alpine regions of Bavaria, Graubünden, Corinthia, Liechtenstein, St. Gallen, South Tyrol, Tyrol and Vorarlberg – present the award to exemplary protection forest projects. In the presence of Graubünden cantonal councillor Mario Cavigelli, government councillors from Liechtenstein and St. Gallen, and national councillors from Tyrol, Vorarlberg and South Tyrol, three projects were honoured in the categories “School projects”, “PR work, innovation and protection forest partnerships” and “Successful projects” at the Arena in Klosters. The Consortium of Alpine Forestry Associations also selected a “protection-forest patron” for their service to protection forests. ... then we meet in the forest where the paths cross, ... then it doesn’t matter if it’s sunny, rainy or snowy, ... then we wear good shoes and working clothes, ... then we take a rucksack full of snacks, ... then we experience and discover nature in all seasons. Fun activities outside of the family home for children aged 4 – 5, encouraging contact with the forest in close collaboration with the forestry service and in an age-appropriate way. The Lechtal forest dwarf called Almajuri is absolutely exhausted. The storm witches have shaken the trees and the snow giant has placed a spell of forgetfulness on the tree spirits. And now the fir ghost no longer knows the difference between the fir tree and the spruce. The larch queen has fallen deeply in love and has lost track of her tasks. And the stone-pine dwarf has completely disappeared. Without its guardians, the protection forest loses its power. Soon, avalanches will be crashing down into the valley, rock falls will block the paths and the white water will flow out of control. Dear children, please help the protection forest, the trees and their guardians. The Almajuri is counting on you. The high potential for natural hazards in the Blons municipality means that this mountain community depends particularly on the condition object-protecting forests for it to remain habitable. Nature-preserving forestry and consistent cloven-hoofed game hunting are managed in an exemplary way in order to create and maintain a protective permanent forest in the long term. Commendable activities in the area of PR have been achieved with the establishment of the avalanche documentation centre and an avalanche nature trail. Frümsen is located in the Werdenberg region at the foot of the steep wooded peaks of the Alpstein. Historically, the walnut tree is the second most important tree species in this landscape, after the beech tree. However, changes in cultivation have caused this tree to almost disappear in the region. Yet for a few years now, the Sennwald forest association has been reintroducing the walnut tree to the forest and the surrounding farmlands. For the fourth time, the Consortium of Alpine Forestry Associations have awarded the title of “protection-forest patron”. 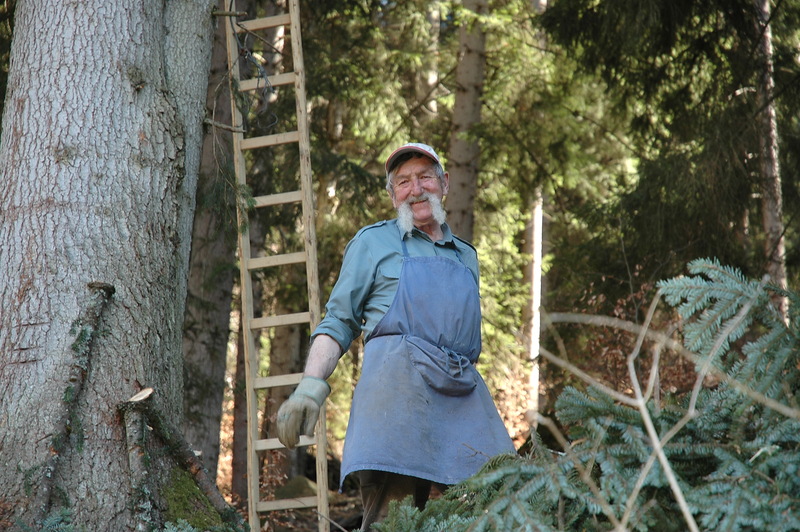 This year, carpenter and timber house builder Ruedi Walli from Fideris in the Prättigau region has been recognized for his services to protection forests. He ran his family’s wood building company, Ruwa, in its second generation and has now passed it on to the third generation. Through his life's work and living by his values, Ruedi Walli has promoted a deep awareness of a sustainable, regional value chain from forest to timber and of the wise use of forests, in harmony with nature. Dwarf Land forest playgroup in Andeer, Graubünden. Restoration of the object-protecting forest in Blons, Vorarlberg. Frümsen walnut village, St. Gallen. Photo 1: Winner in the category school project: Dwarf Land forest playgroup in Andeer, Graubünden. Photo 2: Winner in the category PR work, innovation and protection forest partnerships: protection forest fairytale, Tyrol. Photo 3: Winner in the category successful projects: Restoration of the object-protecting forest in Blons, Vorarlberg. Photo 4: Winner of the jury’s special prize: Nussdorf Frümsen, St. Gallen. Photo 5: Protection-forest patron 2018: Ruedi Walli. Photo 6: Nominated school class from Tyrol of the category school project. This media release is also available on our website www.helvetia.com/media. The Helvetia Alpine Protection Forest Award (Alpiner Schutzwaldpreis Helvetia) seeks to make people more aware of the importance of protection forests and to commend projects making a special contribution to this type of woodland. In many parts of the Alps, it is thanks to protection forests that people are able to live and work in these regions at all. The Protection Forest Award was established by the Consortium of Alpine Forestry Associations. Since 2011, Helvetia has been actively involved in the preservation of protection forests and the reforestation of these areas. Thanks to the projects it has supported, a total of around 280,000 trees have been planted as part of reforestation in Germany, Italy, Austria and Switzerland. The Helvetia insurance group has been the main sponsor of the Alpine Protection Forest Award since 2014. The company has for many years been committed to the maintenance and retention of Alpine protection forest. In 160 years, the Helvetia Group has grown from a number of Swiss and foreign insurance companies into a successful international insurance group. Today, Helvetia has subsidiaries in its home market Switzerland as well as in the countries that make up the Europe market area: Germany, Italy, Austria and Spain. With its Specialty Markets market area, Helvetia is also present in France and in selected regions worldwide. Some of its investment and financing activities are managed through subsidiaries and fund companies in Luxembourg and Jersey. The Group is headquartered in St.Gallen, Switzerland. Helvetia is active in the life and non-life business, and also offers customised specialty lines and reinsurance cover. Its business activities focus on retail customers as well as small and medium-sized companies and larger corporates. With some 6,500 employees, the company provides services to more than 5 million customers. With a business volume of CHF 8.51 billion, Helvetia generated underlying earnings of CHF 491.8 million in the 2016 financial year. The registered shares of Helvetia Holding are traded on the SIX Swiss Exchange under the symbol HELN. This document was prepared by Helvetia Group and may not be copied, altered, offered, sold or otherwise distributed to any other person by any recipient without the consent of Helvetia Group. The German version of this document is decisive and binding. Versions of the document in other languages are made available purely for information purposes. Although all reasonable effort has been made to ensure that the facts stated herein are correct and the opinions contained herein are fair and reasonable, where any information and statistics are quoted from any external source such information or statistics should not be interpreted as having been adopted or endorsed as accurate by Helvetia Group. Neither Helvetia Group nor any of its directors, officers, employees and advisors nor any other person shall have any liability whatsoever for loss howsoever arising, directly or indirectly, from any use of this information. The facts and information contained in this document are as up to date as is reasonably possible but may be subject to revision in the future. Neither Helvetia Group nor any of its directors, officers, employees or advisors nor any other person makes any representation or warranty, express or implied, as to the accuracy or completeness of the information contained in this document. This document may contain projections or other forward-looking statements related to Helvetia Group which by their very nature involve inherent risks and uncertainties, both general and specific, and there is a risk that predictions, forecasts, projections and other outcomes described or implied in forward-looking statements will not be achieved. We caution you that a number of important factors could cause results to differ materially from the plans, objectives, expectations, estimates and intentions expressed in such forward-looking statements. These factors include: (1) changes in general economic conditions, in particular in the markets in which we operate; (2) the performance of financial markets; (3) changes in interest rates; (4) changes in currency exchange rates; (5) changes in laws and regulations, including accounting policies or practices; (6) risks associated with implementing our business strategies; (7) the frequency, magnitude and general development of insured events; (8) mortality and morbidity rates; (9) policy renewal and lapse rates as well as (10), the realisation of economies of scale as well as synergies. We caution you that the foregoing list of important factors is not exhaustive; when evaluating forward-looking statements, you should carefully consider the foregoing factors and other uncertainties. All forward-looking statements are based on information available to Helvetia Group on the date of its publication and Helvetia Group assumes no obligation to update such statements unless otherwise required by applicable law.